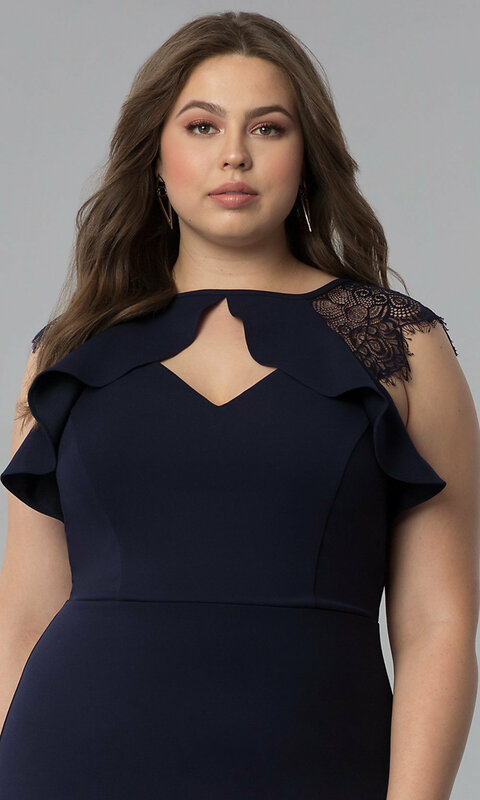 Totally unique, this navy blue plus-size party dress is fresh and flirty. A scoop neckline graces the bodice of this fun blue sheath dress, as a keyhole front creates the illusion of an alluring v-neckline. A soft jersey ruffle tops the keyhole cut out to kick the style up a notch as a captivating scallops trim the flounce. Delicate lace with fringed edges forms short cap sleeves for coverage with a fashionable twist. Also enticing, a deep v-back mirrors the keyhole cut out in front. Finishing the look of this short navy party dress in plus sizes, a hip-hugging short skirt flatters the figure. The model is 5'11" and wearing 2.5" heels.